For most children who are caregivers, dealing with aging parents can be a joy and a stressful situation at the same time. While most adult children do enjoy taking care of the parents who cared for them for so many years, occasions occur where a parent requires the level of care that exhausts the caregiver. No matter the level of care required, there are many options available to help children care for their elderly parents. Offering to do these little tasks can really help an older adult, who might not always feel up to the extra work. Aging parents often need help with things such as remembering to take medications or healthy foods for meal times. If your parent's vision has decreased because of cataracts, glaucoma or other issues, he or she may not be able to drive any longer and may need a ride to the doctor, or just to go shopping. A healthy parent who simply needs extra help may be able to still live in his or her own home, but there are also many assisted living facilities that offer extra care and fun activities the parent may enjoy. It isn't any surprise that those performing all of these tasks tend to get burnt-out quickly. Although no one wants to put their parent in a nursing home, there are occasions when getting extra help is necessary. If the parent requires frequent medical care, is bedridden or needs medication during times when the caregiver cannot provide care, then a senior facility may be the best option. There are also options for hiring in a nurse or senior caregiver to come into the parent's home a few hours each day. This can be a great help to the caregiver, taking some of the stress of him or her. It also can solve issues that require medical help, but still allow the senior to stay at home. 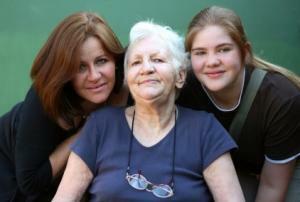 When dealing with an aging parent, always keep your patience and remember when your mother or father cared for you. Parents spend many sleepless nights walking the floors with a restless infant and later walking the floors while waiting for a wayward teen to get home from a Friday night out on the town. Remember all the good times the two of you have had and share those memories with your parent. This will also taking the parent's mind of their failing body and let him know that you remember all the good times and he will live on in your heart forever.